There is a cluster of 'treasuries', built by states in Greece and overseas as repositories for valuable offerings and equipment for embassies. Since treasuries were small and were bound to be compared with one another, they tended to be especially fine or showy in execution and they provide the first buildings in Greece entirely of marble. The Athenian Treasury, gives a fair idea of their scale and quality. 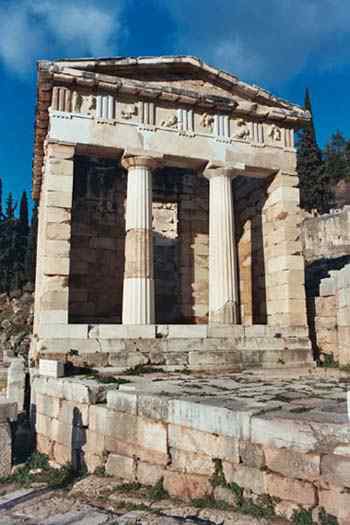 The Treasury of the Athenians is a doric building made from aegean island marble, has been rescued a big part of its material and was restored in 1903-6 with money of municipality of Athens. Though Pausanias dates the monument after 490 B.C. indicating that it was built with the spoils of the battle of Marathon, the examination of the embossed metopes that decorate the building, leading to earlier dates around 505 - 500 B.C. 40 metopes of the treasury had in the east side a scene of Amazonomachy, in the north and west side labors of Hercules and in the north feats of Theseus. In the North side of the treasury exists triangular platform where Athenians had placed the spoils of the battle of Marathon, as the inscription in the upper structure reports. From a lot of inscriptions that had been engraved in the walls of building most interesting are the two hymns to Apollo that apart from the text, they bring also musical symbols (notes) that are very important for the understanding of ancient music (today at the museum). Argians Kleobis and Biton (today at the museum). The Treasury of Sicyon, just before it and again of around 500 B.C., is notable for the remains of two older Doric structures re-used in its foundations; one was a round building of about 580 B.C., the other —perhaps twenty years later—a sort of baldachino (like a temple with colonnade but no cella) to which belong the engaging sculptures in the Museum that are known as the metopes of the Sicyonian Treasury. In the rocky terrain above the Athenian Treasury there was a little shrine of Earth, who legend says preceded Apollo as patron and prophet of Delphi. at about 525 B.C., when as mentioned by Herodotus, the Siphnians were in high economic growth due to the exploitation of gold mines. 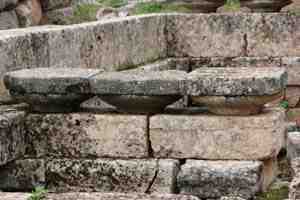 columns had kores, ie dressed female forms which they supported by their heads the architrave. The frieze of the treasury, from the most important works of the cycladic sculpture brought representations with concentration of greek Gods who watched episode of Troyan war (east side), battle of Gods with the Giants in the north side, Paris judgement about the most beautiful goddess at the west side, and probably the abduction of Leucippos' daughters by Dioskouroi to the South. In the east pediment of the treasury is depicted the known quarrel of Apollo with Hercules who tried to take the delphic tripod in order to set up his own oracle.